The effects of phosphorus (P) on the properties of steels are summarized in Tab 1. It can be seen that P has both positive and negative effects on the steel’s properties. Steels having low content of P are necessary for applications where high ductility is needed, such as thin sheets, deep drawn steel, and pipelines etc. In the earlier days, P control was not considered a big challenge in steel production since iron ores with low P contents were readily and cheaply available. However, in the recent past, because of high iron ore prices, lower priced iron ores from sources which normally have higher P content are being used and this has made P control an important activity during the steelmaking. In addition to P from in the iron ores, P also enters the liquid steel due to the recycling of the BOF (basic oxygen furnace) slag. The recycling of the BOF slag is being done through the sinter plant or directly into the blast furnace in order to retrieve the iron and lime content of the slag and to minimize the issues related to slag disposal. The sinter or the BOF slag fed to the blast furnace inevitably increases the P content of the hot metal and hence the P loads on the steelmaking process. In integrated steel plants, the removal of P normally takes place during the primary steelmaking process usually the BOF process. In order to meet new demands for P control, it is necessary to improve the understanding on the thermodynamics and kinetics of the P partitioning reaction between slag and metal melts during steelmaking process. Dephosphorization of steels has become a very important metallurgical technique in steelmaking process to produce high quality steels. As the P content is controlled by the reactions in BOF, the double slag technique has generally been applied to obtain low P killed steels. However, this technique is accompanied by the increase in operating time and the decrease of the yield of the steel. In addition to the productivity problems with this technique, an enormous amount of BOF slag is also generated during the operation of the BOF. Phosphorus can also be removed during the steel refining process. In fact, over 90 % of the input P in the melt can be removed in the BOF. The refining capacity of the slag depends of many variables such as slag and metal compositions, temperature, time and intensity of slag/metal stirring. The content of P in liquid steel during tapping, deoxidation, inert gas blowing, and casting can increase gradually due to its introduction with deoxidizers and reduction from a slag. This possibility is to be taken into account for maintain the dephosphorization conditions in the liquid steel. As a result of reactions between the steel, slag, and deoxidizers, P equilibrium shifts toward an increase in the P content in the steel despite a significant decrease in the temperature. In this case, dephosphorization depends substantially on the ratio of the steel to slag weight. The role of these factors can be deduced from the following P balance equation. (P content in ladle slag) + (P content in ladle steel) = (P content in tapped metal) + (P content in slag trapped by steel in ladle) + (P from deoxidizers). The initial comprehensive studies on dephosphorization were conducted during the 1940s. These studies observed that FeO and CaO are necessary slag constituents for the dephosphorization of steel. These studies also showed that the dephosphorization reaction is exothermic and that the slag capacity for dephosphorization decreases with temperature. The studies have also observed that dephosphorization is enhanced by a decrease in temperature and increase in FeO content and basicity of the slag. Many correlations have been developed to predict the P partition ratio as a function of metal and slag composition as well as temperature. However, there are still disagreements in the laboratory data and the equilibrium P partition which can be predicted. Although the quantification of P equilibrium is extremely important, many of the steelmaking furnaces do not operate at equilibrium, usually due to liquid slag formation, kinetics and time constraints. Thus, it is important to know how close to equilibrium steelmaking furnaces operate in order to suggest optimal slag compositions to promote dephosphorization. It was noted during early studies that the stirring conditions and slag composition are two key variables to enable optimum P removal. Also, over saturating the slag with CaO and MgO does not seem to benefit the process to any extent. It was found during these studies that dynamic interfacial phenomena at the metal-slag interface is likely to play a significant role in the kinetic behaviour of the system, due to the exchange of surface active elements, such as oxygen (O2), which dramatically lowers the interfacial tension and cause spontaneous emulsification. It was also found that P do not play a role in spontaneous emulsification and it is rapidly removed before the onset of dynamic interfacial phenomena. Emulsification is caused maybe by deoxidation of the metal after P removal has taken place and the metal has become super-saturated with O2 by an unknown reason. The estimated surface area rapidly increases by over an order of magnitude during the beginning and intermediate periods of the reaction. The metal drop breaks into hundreds of small droplets, effectively emulsifying the metal into the slag. With time, the surface area decreases and the metal droplets coalesce. Similar results were observed for an iron (Fe) droplet being oxidized. In 1950s, it was proposed that it is satisfactory to consider the reaction taking place in its simplest form as given below. At T more than 1382 deg K, Delta G? becomes positive which results in decomposition of P2O5 to P and O. Thus removal of P requires that P2O5 need to be reduced. The activity coefficient of P2O5 is increased by silica (SiO2) and decreased by basic oxides such as CaO and MgO. During the 1980s further studies were carried out on P partitioning in various slag systems. These studies have indicated that the P distribution ratio increases with increasing content of CaO in the slag and with decreasing temperature. It is also seen that the effect of CaF2 on dephosphorization is the same as CaO without raising the melting point of the slag. The effects of barium oxide (BaO) and sodium oxide (Na2O) on P partitioning were also studied. These studies concluded that the CaO equivalencies of Na2O and BaO are 1.2 and 0.9 on weight percent basis respectively. The P distribution in the different slag systems has been studied numerous times and several co-relations have been developed. The various conclusions of these studies are summarized below. The CaO, MgO, SiO2, P2O5, FeO, and MnO contents of the slag have influence on the P partitioning. The liquid slag is fully ionized and P in the slag exists as a phosphate ion. The log of the P partition is increased with 2.5 log % FeO as predicted by the thermodynamics and that increasing slag basicity also increases the partition coefficient. Increasing the slag basicity (CaO/SiO2) up to 2.0 has a strong increasing effect on the P partition. However, the increase is much less pronounced with basicities above 2.5. The P partition ratio initially increases with increasing FeO content but then decreases after a certain level is reached. This level is a function of slag basicity and temperature. These conclusions are also hold for FeO contents in the slag between 15 % and 25 %. More specifically, the P partition is independent of FeO contents above 19 %. Additionally, the P partition appears to be lower with an increase of MgO content at temperatures of 1600 deg C and 1650 deg C.
For slags containing from 0.2 % to 1.0 % of P2O5 the log of the activity coefficient of P2O5 is a linear function of CaO and MgO content and that there is no temperature dependence. For slag containing P2O5 more than 1 % the log of the activity coefficient of P2O5 is also a linear function of CaO but it also has temperature dependence. The increases in the concentrations of Ca2+, Fe2+ and Mg2+ result in a decrease of the activity coefficient of P2O5 whereas (SiO4)4- has the opposite effect. Polymerization of P does not occur extensively in the slags normally found in steelmaking. Other approaches to model P partition between steel and slag have been also been tried. In 2011, an exhaustive thermodynamic model based on the ion and molecule coexistence theory (IMCT) has been developed to predict P distribution ratio between CaO-SiO2-FeO-Fe2O3-MnO-Al2O3-P2O5 slags and liquid steel. The IMCT assumes that the slag is composed of simple ions, such as Ca2+, Fe2+, Mg2+ and O2-; simple molecules, P2O5, SiO2 and Al2O3; silicates, aluminates and many others as complex molecules. Every ionic species takes part in reactions to form complex molecules from (Me2+ and O2-) ion couples and simple molecules and are under thermodynamic equilibrium. The possible P molecules taken into account are P2O5, 3FeO.P2O5, 4FeO.P2O5, 2CaO.P2O5, 3CaO.P2O5, 4CaO.P2O5, 2MgO.P2O5, 3MgO.P2O5 and 3MnO.P2O5. It has been found that 3CaO.P2O5 and 4CaO.P2O5 has a contribution to the measured P partition of 96 % and 4 % respectively. The discussion so far involved the P equilibrium between liquid steel and liquid slag. However, due to the multicomponent nature of steelmaking slags, it is not uncommon to have possible solid phases in equilibrium with the liquid slag. Substantial studies have been carried out on specific solid phases which are common in the steelmaking slags. More specifically, studies have focused on slags containing 2CaO.SiO2 and CaO particles. These solid phases are normally present in steelmaking slags during BOF process and can play a role in dephosphorization since phosphates can be dissolved in them. A good steelmaker is also a good slag maker’ is a popular saying amongst the steelmaking personnel and is very relevant in the context of BOF process. Having a good control over slag formation and composition enables optimum refining and minimizes the risk of having to reblow the O2 or to make extra additions at the end of the heat. During the beginning of the blow, the lance is kept high above the surface of the metal. During the first 3 to 4 minutes Si (silicon) from the metal rapidly oxidizes together with Fe forming a slag rich in FeO and SiO2. Substantial amounts of lime and dolomitic lime are added into the BOF. As the blow continues, solid lime continuously dissolves into the liquid slag increasing the slag mass and basicity. As decarburization continues, the slag starts to foam and the CO gas generated reduces the FeO content in the slag. Close to the end of the blow, the decarburization rate decreases and Fe oxidation becomes significant again. Throughout the blow the metal temperature steadily increases from 1350 deg C to 1650 deg C and the slag temperature is generally 50 deg C higher than the metal at the end of the blow. The mechanism of lime dissolution is very relevant to BOF process and P removal. Achieving fast dissolution of lime during the BOF process provides good opportunity to increase productivity, reduce process time and cost. The dissolution mechanism of lime is a function of slag composition and the saturation level of dicalcium silicate (2CaO.SiO2). The initial slag is rich in FeO and SiO2. When lime is first added and starts dissolving, a layer of 2CaO.SiO2, forms around the solid particles and slows down the lime dissolution rate. This solid layer can rupture and slag can further penetrate into the pores of the lime particle and continue dissolution. The slag penetration is a function of viscosity and pore size of the solid particle. Since in the BOF process there are frequently some solid oxide phases coexisting with the slag, it is important to understand how solid particles can influence the P removal. Several studies have looked at the solubility of P in different solid particles such as CaO, 2CaO.SiO2 and 3CaO.SiO2. The following are the some of the inferences of these studies. Phosphorus partition between the 2CaO.SiO2 particles and the slag varies between 2 to 70 as the FetO content and basicity in the slag increases. The temperature dependence of P distribution is found to be very weak and the 2CaO.SiO2 isolated particles shows complete uniform transformation to 2CaO.SiO2-3CaO.P2O5 within 5 seconds. Upon contact with the CaO-FetO-SiO2-P2O5 slag, the CaO particle is quickly encapsulated by a layer of 2CaO.SiO2-3CaO.P2O5 and a CaO-FetO slag without P2O5 being formed between the CaO particle and the 2CaO.SiO2-3CaO.P2O5 solid solution. There are two possible routes for P transfer from slag to 2CaO.SiO2. In the first route, 2CaO.SiO2-3CaO.P2O5 would precipitate from the liquid slag after P is transferred from the metal phase. In the second possible route, 2CaO.SiO2 particles already present in the slag before P is transferred from the metal. P is then diffuse into the precipitated, P free, 2CaO.SiO2 particle. It has been found that the P transfer rate by the precipitation route is much faster than by the diffusion route. This points the fact that having pre-existing 2SiO2.SiO2 particles does not necessarily improve P removal. During the blow in BOF process a very dynamic environment is created. As the O2 jet hits the surface of the slag and, subsequently, the liquid metal, it creates a three phase gas-slag-metal emulsion, which significantly increases the total interfacial area available for several chemical reactions to occur between the phases. Metal droplets are continuously ejected from the bulk metal bath into the slag-gas mixture where they can react for a given amount of time. The generation of these metal droplets is very important for the kinetics inside the BOF. The rate of refining, during the BOF process, is not only a function of the chemical kinetics but also a function of the residence time that a given metal droplet spends in the slag. The calculated residence time of a metal droplet being ejected from the bulk metal traveling in a ballistic trajectory across the slag is less than 1 second which is too short for a given droplet to react to a significant extent. However, during the study of the behaviour of Fe-C droplets in slag, it has been observed that the formation of a gas ‘halo’ while decarburization is occurring, keeps the metal droplet suspended in the slag from 50 seconds to 200 seconds. Based on these observations, the model is modified to include the effect of decarburization on the apparent density of a metal droplet and is able to predict consistence residence times. The report entitled ‘Imphos: Improving Phosphorus Refining’ published in 2011 has looked, among other topics, at metal/slag ratio profiles, size distribution of metal droplets in the slag/metal emulsion, P distribution at slag-metal interface and lime dissolution. 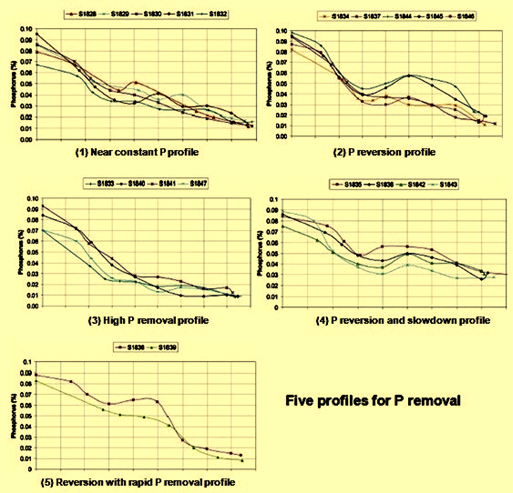 The report has defined five P removal profiles as shown in Fig 1. These profiles are (i) near constant P profile, (ii) P reversion profile, (iii) high P removal profile, (iv) P reversion and slowdown profile, and (v) reversion with rapid P removal profile. For each of these profiles, the amount of metal and its chemical composition has been studied for the slag /metal emulsion and for the bulk bath. It has been found that the P content of the metal drops in slag is usually lower than or equal to the bulk bath, pointing to the fact that P removal is driven by dephosphorization of metal droplets present in the slag /metal emulsion rather than in the bulk bath. One interesting observation in the report is that, during the early stages of the blow, P removal in the emulsified droplets happened a lot faster than decarburization. Metal droplets are found to be extremely depleted in P (much less than 100 ppm) while there is well over 1 % C in the bath. This is potentially related with the gas ‘halo’ and emulsification, which can increase the residence time of droplets during the early stages of the blow giving it enough time to react with the highly oxidizing slag present, resulting in fast P removal if the droplet size is appropriate. Since P removal is strongly related to the generation of metal droplets, there is an ideal lance height during each stage of the blow to maximize droplet generation and create a good slag/metal/gas emulsion. It is observed that as lance height decreases, fewer metal droplets are generated. The dephosphorization mechanism in the BOF process can be summarized as below. During the beginning of the blow, where the O2 lance is kept high, good ejection of droplets is achieved and P removal happens fast. As the blow continues and decarburization starts generating CO gas, FeO in the slag is reduced and the slag can become not oxidizing enough. This can result in reversion of P into the melt as droplets are rephosphorized and return to the bulk metal. This is especially important if dissolution of lime is not optimum. Closer to the end of the blow, decarburization slows down and the FeO content in the slag increases favouring dephosphorization once again. This however, may not be enough to compensate for the possible reversion that occurred earlier. Optimum results can be achieved by closely monitoring FeO and CaO in the slag. Iron ore additions can be helpful to maintain ideal FeO content to continue P oxidation in parallel with the decarburization. Though P equilibrium has been widely studied, the kinetics of P removal has not been studied to that extent. However, the same principles for other high temperature metallurgical reactions apply. When P dissolved in Fe contacts slag, several steps which provide basic illustration of the phenomenon, take place during the dephosphorization reaction. These steps are as follows. Since the dephosphorization occurs at high temperatures, it is reasonable to assume that the chemical reaction at the interface is fast and at equilibrium. Therefore, the possible rate limiting steps are mass transfer in the metal or slag phases or both, if it is assumed that there are no solid phases present in the slag capable of absorbing phosphorus. One of the studies on the kinetics of dephosphorization of Fe-C(sat)-P hot metal by oxidizing slags, shows that one of the main challenges in dephosphorization of liquid metal is to correctly quantify the driving force for the reaction due to the non-equilibrium O2 potential at the slag/metal interface. This non-equilibrium occurs due to the decarburization of liquid metal which lowers the O2 potential in the metal. In such cases, the slag is at a high O2 potential while the metal is at a low O2 potential. During the study it has been found that dephosphorization reaction follows first order kinetic rate with respect to P concentration in the metal and higher FeO contents increase the mass transfer coefficient of the slag due to a decrease in viscosity, even though FeO can also impact either positively or negatively the driving force of the reaction. The study also indicated that mass transport in the slag phase is the rate limiting step in the dephosphorization of metal. More recently, another study used a mathematical approach to quantify the mass transfer of P between metal and slag. The study has shown that the apparent mass transfer coefficient seems to be a function of interfacial tension, which is affected by the mass flux of a surface active element, such as O2, especially under rapid mass transfer conditions. The changes in the mass transfer parameter are related to dynamic interfacial phenomenon which enhances the mass transfer during periods of high flux of O2 across the interface. This high flux of O2 is suggested to lower the interfacial tension during the reaction which leads to an increase in the interfacial area or mass transfer coefficient or both. Several studies have shown that spontaneous emulsification can occur during periods of intense mass transfer of surface active elements due to a very pronounced reduction in the interfacial tension between two immiscible liquids. Also, for the equilibrium interfacial tension, the O2 and S (sulphur) contents in the metal play a significant role on the observed equilibrium tension. The addition of CaF2 and Na2O raise the interfacial tension but MnO additions tend to lower it. One of the studies has shown that when the O2 flux becomes larger than about 0.1 g atom/sqm sec, the interfacial tension approaches a value close to zero. When O2 flux becomes lower than 0.01 g atom/ sqm sec, interfacial tension rapidly increases to a value close to the equilibrium tension. The dephosphorization kinetics has been far less studied than P equilibrium between metal-slag. There are disagreements whether mass transfer in the metal, slag or both controls the rate of the reaction. Due to the nature of the reaction, a dynamic interface phenomenon appears to have a significant role on the overall rate of the reaction. Spontaneous emulsification seems to occur when rapid mass transfer of O2 takes place at the interface of metal-slag systems. This results in a substantial decrease in interfacial tension, thus increasing the reaction area and its overall rate. However, direct calculation of changes in reaction area due to spontaneous emulsification remains very difficult.